Shows at Zombie Joe's Underground Theater run quite a range. 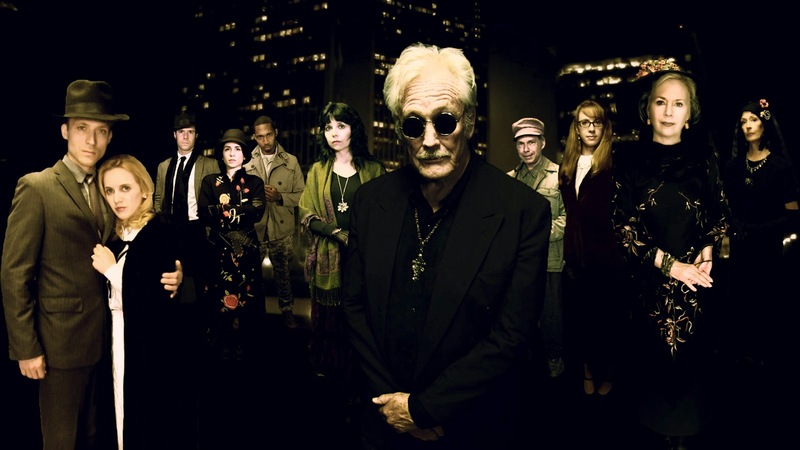 One hallmark of many 'signature' pieces from the group is a kind of performance art, focusing not so much on horror per se but rather the darkest parts of our collective unconscious. Haunted Walls and Apparitions makes for a good example of this. Director Zombie Joe continues to experiment, in this case ripping away the fourth wall or really almost any barrier between performance and audience, between cast and guests. In fact that makes for part of the fun! People were standing against the walls on opening night, and more than once came into contact quite startlingly with the cast! I myself became a participant! Suffice to say you might want to bring a pencil or pen with you to the show. Just in case you're presented with a test. A term I've sometimes used to describe shows here is Theatre of Dreams, which still seems appropriate. Also it avoids answering questions about whether this counts as surrealism, expressionism, etc. Dream-like conveys what we experience, in this case a set of strangely hilarious nightmares. Please note the word "hilarious." Because what happened early on and continued throughout was audience laughter! Mind you, took a few moments to get into the feel of things, but we started laughing pretty soon and kept it up. Partially because we got to enjoy the faces of fellow audience members! Followed by the kind of gestalt ZJU regulars have come to recognize, even expect. A cast of actors constantly shifting and melding into scenes and characters. Dinosaurs hunting each other millions of years ago. Animals undergoing a sudden burst of evolution. An evocative interplay of sexuality in couples and groups as well as individuals. Transcendance. Some kind of operating room. A mad prophet speaking words that almost (but only almost) make no sense at all. The words spoken, given how few are, end up with a lot of power and weight. And for the record I think the line "Lets keep the cute in persecute" comes out of some kind of brilliance. Are you getting the impression this show is hard to describe? It isn't, not really. I can honestly and clearly say the show easily achieves a dark, nightmarish comedy. That is has no plot, but something of a story. Was I totally engaged? Yes! Was I ever confused? Often! In a good way. At times I could feel my perceptions genuinely strain against the edges of this mental box. 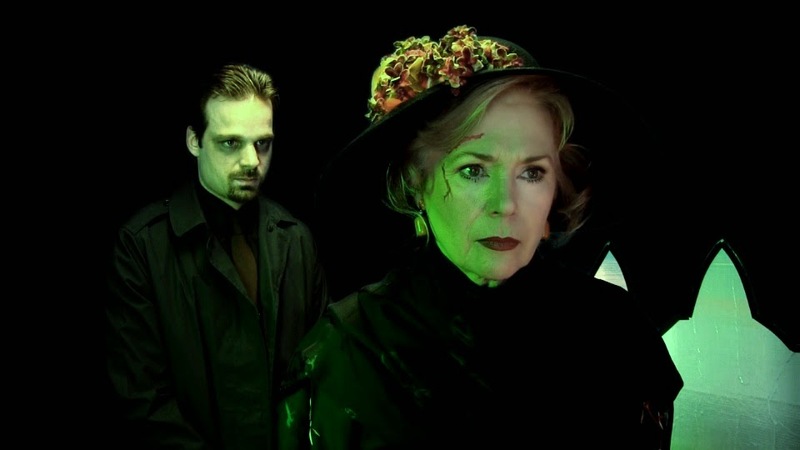 The actors used makeup and movement like masks. They lived and died on stage, portraying humans and animals and sometimes machines. But at heart, you really need to see this show for yourself, to experience it individually, to really understand what it is all about. Which methinks is the idea. 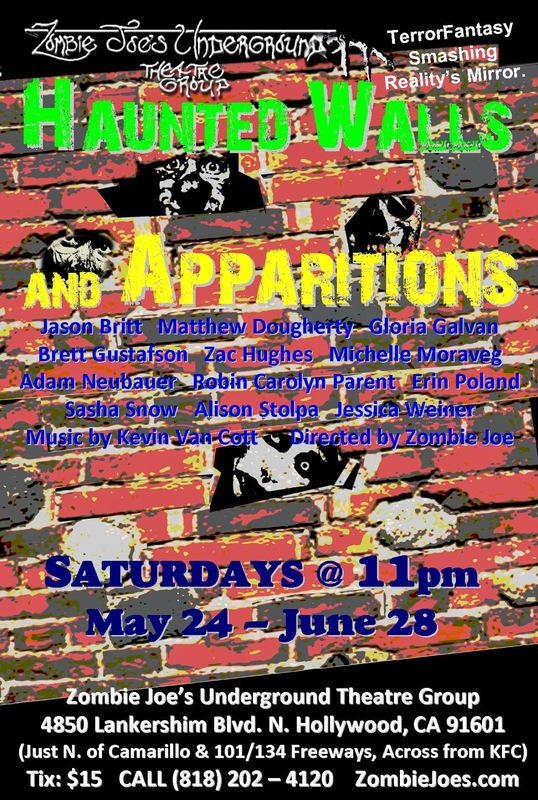 Haunted Walls and Apparitions plays at Zombie Joe's, 4850 Lankershim Blvd. (north of Camarilla & the 101/134 fwys, across from KFC) North Hollywood CA 91601. Call (818) 202-4120 for tix. Shows on Saturdays at 11pm from May 24 to June 28. We tend to think of movies as realistic or in some sense naturalistic. Even if we don't think in those terms, most of us expect a film to look more-or-less like the world around us. Movies began essentially as hundreds of photographs shown to us at a certain number per second, in order, to create the illusion of life. But of course they aren't real. Never have been. And increasingly the most popular of them--from Star Trek to Avatar to Harry Potter--make things totally imaginary (like dragons or starships) look real. 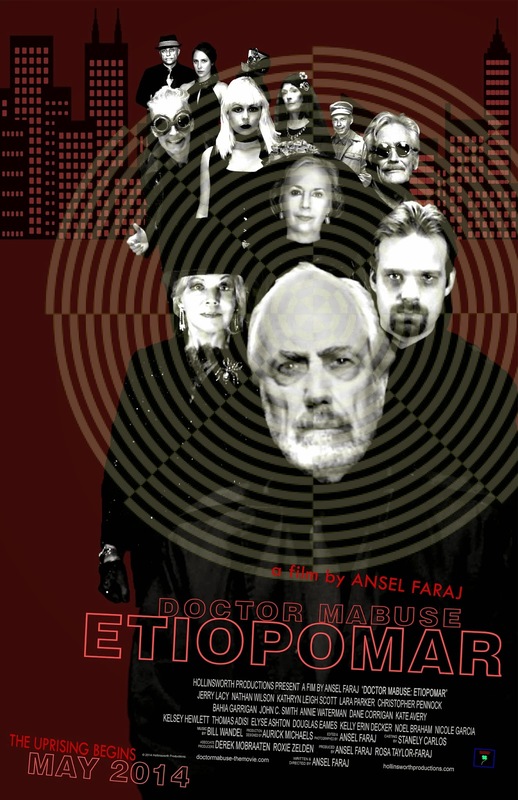 Doctor Mabuse: Etiopomar does the precise opposite.Filmmaker Ansel Faraj takes his cue from German Expressionism, transforming reality into a kind of dream. He even uses that wonderful computer editing effect of green screen and chromokey to help further that aim. For much of this film, the characters wander in and around a city placed behind them via editing software, every detail rendered odd, not-quite-real and yet vivid. The result ends up looking like another world, a vaguely steampunk dimension where sunlight somehow seems a little alien. A place of secrets and powers, of elaborate plots woven throughout the city that is Etiopomar. For those of you who don't know, Dr. Mabuse became the central character in a series of films by the great director Fritz Lang. A little bit of a cross between Moriarty and the wizard Merlin, he fit a niche in some ways not unlike Hannibal Lecter today. A villain who fascinates. A criminal who understands that which we do not. The outsider (even when at the center of things) who remains a fount of wisdom as well as very real danger. Faraj intertwines this archetype with elements from another Lang masterpiece, Metropolis. This incarnation of Mabuse (Jerry Lacy) has him as secret lord and master of Etiopomar, a city now strangely empty after a few years under his control. Exactly what Mabuse might be--from what source his vast powers (seemingly psychic and/or mystical in nature) derive--we never quite get an answer. But he's not alone. In particular a group of sisters aid and thwart him. They seem to have similar powers, most of them certain the time of "their kind" is coming to an end. Mabuse on the other hand intends to last forever. Hence his search for a certain Key, and the construction of an army of automatons to do his bidding--machines made to look like humans. 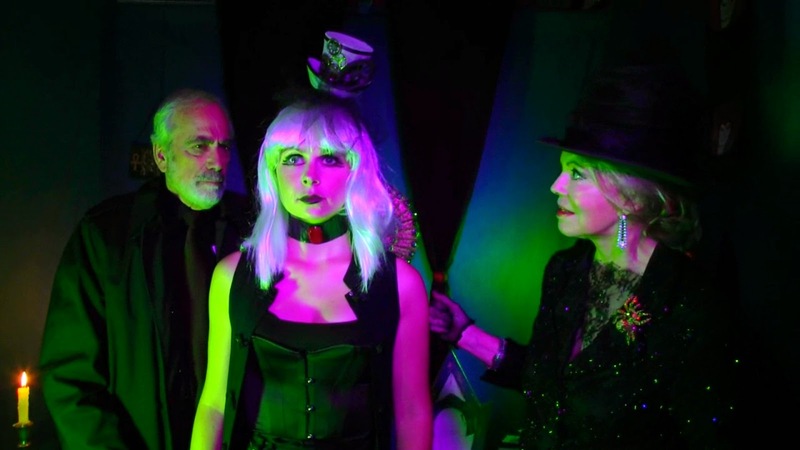 Meanwhile at least two of the sisters seek to counter Mabuse, setting up a seemingly ordinary young woman named Lucy (Kelsey Hewlett) with a rare Gift--a fact her new husband Michael (Thomas Adisi) begins to notice. And a revolutionary group longs to rise up against the man they call The Tyrant. 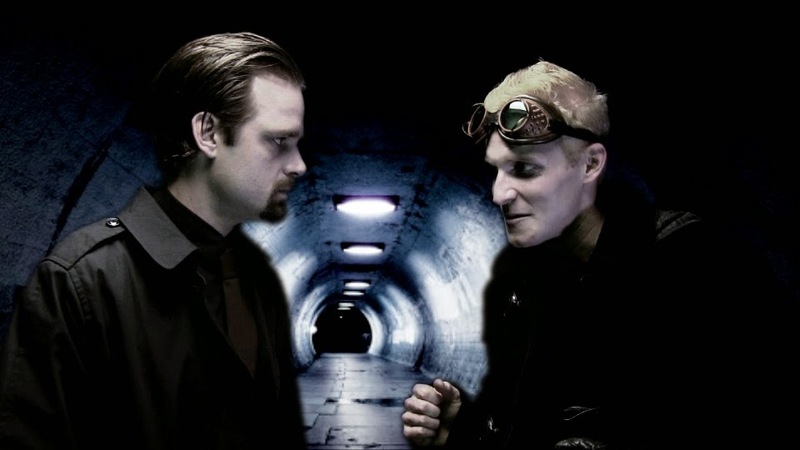 Meeting in the shadows, in underground archives and abandoned churches, sending spies out into the city, the resistance led by Professor Konratz (Christopher Pennock) wait for their chance to rise up. Wait and plan and set into motion their own minions. One result of all this is a certain ambiguity. We all tend with like simple narratives. Someone is Right (and not just in the sense of being virtuous) and someone else clearly Wrong (in more than just ethical terms). But what if everyone is both, in very nearly every way? Interestingly, and tellingly, nearly every single character in this film feels utterly sure of what they are doing. Doubt on their part nearly always ends up followed by violence. Likewise those who begin with doubt like Gabelle (Kelly Erin Decker) seem the most good, even if they commit terrible deeds. Madame Von Harbeau (Kathryn Leigh Scott) for example blanches not at all at the thought of allowing the innocent to suffer and die, or whole cities to burn. She has no doubts. And amid all this stands Mabuse himself--who hates and loathes doubt, whose ruthlessness seems unbounded, yet stays his hand more than once. He depends upon others, such as Von Harbeau's sister Madame Carrozza (Lara Parker) and the scientist Rotwang (Dane Corrigan). So again, we aren't given a clear cut Hero or Villain. In contrast to others, he fascinates us just a bit more, evokes a grudging admiration. The dreamlike city of Etiopomar becomes a battleground for different factions, an apocalyptic labyrinth of mystery and paranoia, some of it totally unjustified while self-fulfilling sometimes. No easy answers, just a fascinating vision in which we must find answers for ourselves. What Tolkien called "history (even if feigned" as opposed to allegory. Does the film work overall? As this review hopefully makes clear, the answer is "Yes." Yet for honest's sake, let us note some strengths and weaknesses. Biggest weakness is budget. Faraj did wonders with what he had, but one cannot help but feel some locations and other details suffered. The size of the "mob" and the "army" involved for example. Likewise some sets seem a tad too cramped, a little less interesting than possible. One gets the impression of every dollar made to stretch a long way--and stretched not quite to breaking point. Yet this is really a nuance. 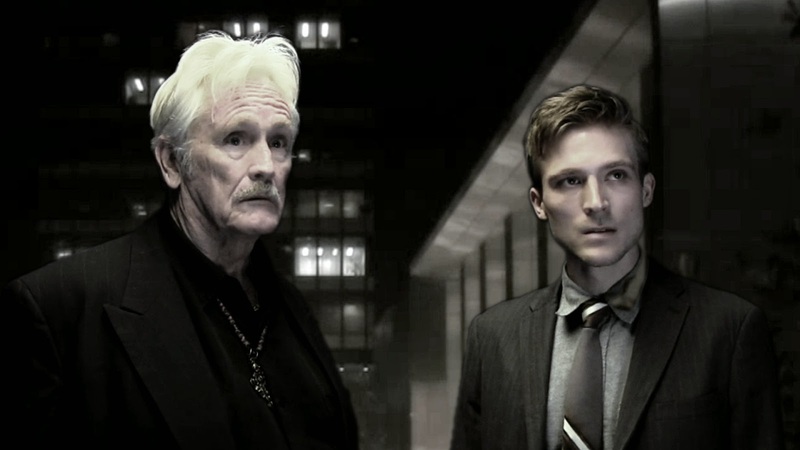 Likewise (and again, a nuance) Nathan Wilson is a fine actor with an impressive intensity but he somewhat lacks the gravitas and power of Jerry Lacy as both play versions/avatars of the pervasive Mabuse. Wilson's body language in particular lacks the deliberate purpose one expects--as if each tap of his cane were an incantation, every step part of a magic ritual. But the film's greatest strength is its vision and the way it draws one inside. Years (and years) ago, attending a Cinema as Literature class in junior college I was one of about two dozen teenagers watching Fritz Lang's Metropolis for the first time. The stylized acting, the too-fast movements (i.e. fewer frames per second than in modern film) etc. caused twitters. For just under two minutes. After that, we were hooked--sucked into a vivid, fascinating world painted in light and shadow. I think Doctor Mabuse: Etiopomar can have the same impact.